This is an area of constant concern for many teachers. We often hear, “What can I do to get my kids to use periods and initial capitals?” Or, “How can I get them to use spaces between their words?” And the proverbial, “They spell all the words correctly for the spelling test, but then misspell the same words when they write.” One thing to keep in mind is that all these things need to be practiced repeatedly. The other thing to note is that the standards are cumulative and provide goals for the end of the school year and often use language such as, ‘with support,’ or ‘with prompting,’ or ‘will use frequently occurring adjectives,’ and so on. Charts are a great way to support this cumulative type of work. Take a closer look at standard 2 a. and standard 2b. as they are closely related and are a good place to start when it comes to editing. 2a. is about capitalization and 2 b. concerns punctuation. Kindergarten… the first word in a sentence and the pronoun I. First Grade… dates and names of people. Second Grade… holidays, product names, and geographic names. Kindergarten… Recognize and name end punctuation. First Grade… Use end punctuation for sentences. Second Grade… Use commas in greetings and closing of letters. If we keep in mind these standards are cumulative we can see that kindergarten teachers are just introducing a few conventions. Then first grade teachers can expect initial capitals and the pronoun I capitalized, since this is the standard for the end of kindergarten. The use of ending punctuation is by the end of first grade. So second grade can set the expectation that ending punctuation will be used all the time at the end of sentences. Enough about standards. Let’s look at some charts! At Charles Barrett Elementary School in Alexandria, Virginia, the awesome kindergarten team was preparing to finish up a unit on writing pattern books. 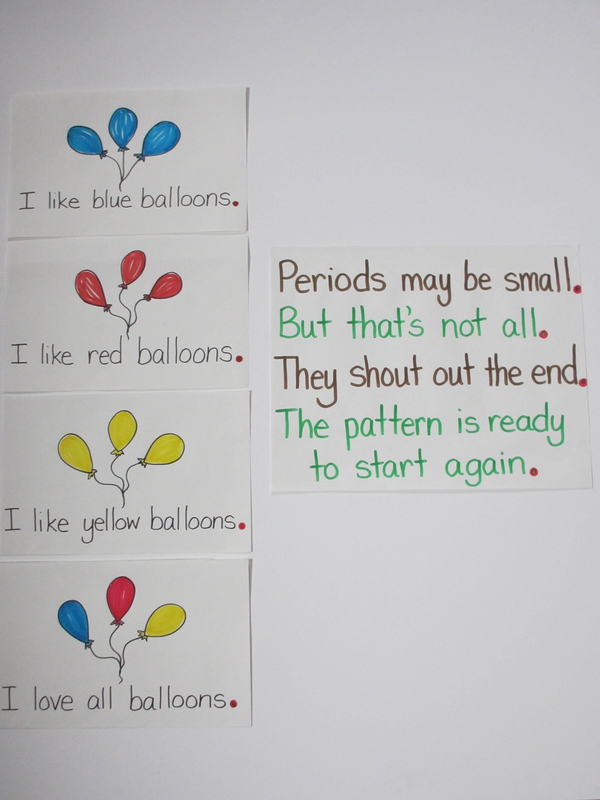 The children had been writing up a storm, and since this unit was designed to support children as they moved into conventional reading the teachers wanted to turn students’ attention to ending punctuation. Just developing an awareness of periods and how they might be used when writing pattern books led to this chant and this chart to be read again and again. Remember, the standard for kindergarten is that children will simply recognize and name end punctuation. Periods may be small, but just look at what they do! The next question the teachers had was what kind of editing chart might they make that would be easy for children to follow and that would introduce the idea of editing. The chart below emphasizes the purpose for editing – it makes your book easier to read. It then contains reminders from previous instruction, but not all children may be remembering to do, like writing their name on every book and stretching out words, hearing more and more sounds. Putting in spaces between words was something that was being emphasized during this unit to help children make one to one match. Putting periods after each sentence is not a part of this chart because it was just introduced and can not yet be an expectation. This chart illustrates how an editing chart is recursive and builds on previous learning, not new learning. 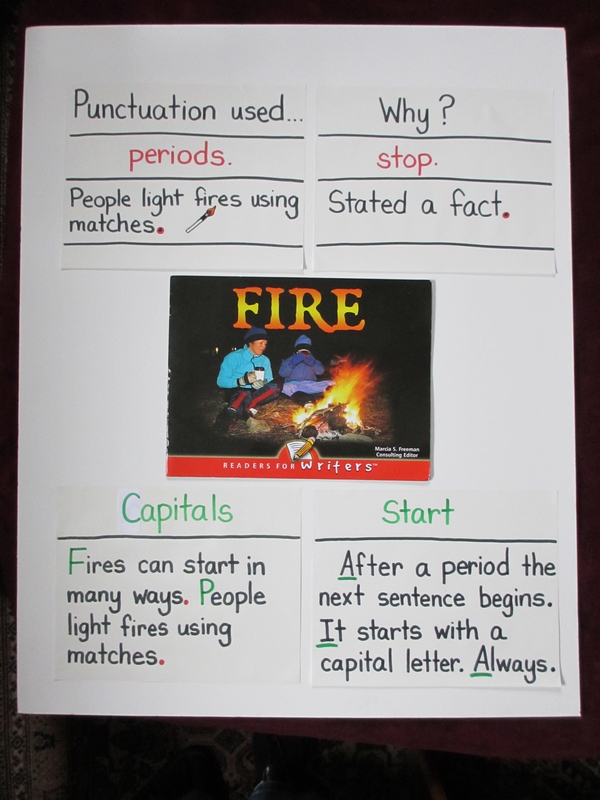 What we noticed about the use of periods and capitals in "Fire" that we can do too. Most inquiries begin with a question, so we began by asking what punctuation did these authors use the most and why? A quick count showed that this author used 18 periods, one comma, one question mark, and one ellipses. This lead to the question, “Which punctuation is the most used? The most important? Periods may be small, but they have a power all their own. The next question was why did the authors decide to use a period where and when they did. Because this was so new, it was the teacher who modeled the thinking by thinking aloud possible answers to this big question. “Hmm, I’m noticing that after the author stated a fact, she put a period. It is almost like she wants to say, “Stop! This period is telling me to stop and think about this fact she is teaching me right now.” before I go on reading. To remind first grade children to use initial capitals, a skill we hope most children have been taught, you might interrupt the workshop to point out that now that everyone was using so many periods, it is a good time to check that after every period you are starting the next sentence with a capital letter. During the share that brings your workshop to a close you can add this important tip to your punctuation chart. Charts are meant to be planned, but also responsive to the needs we see as they come up. Each key editing point is stated and illustrated. 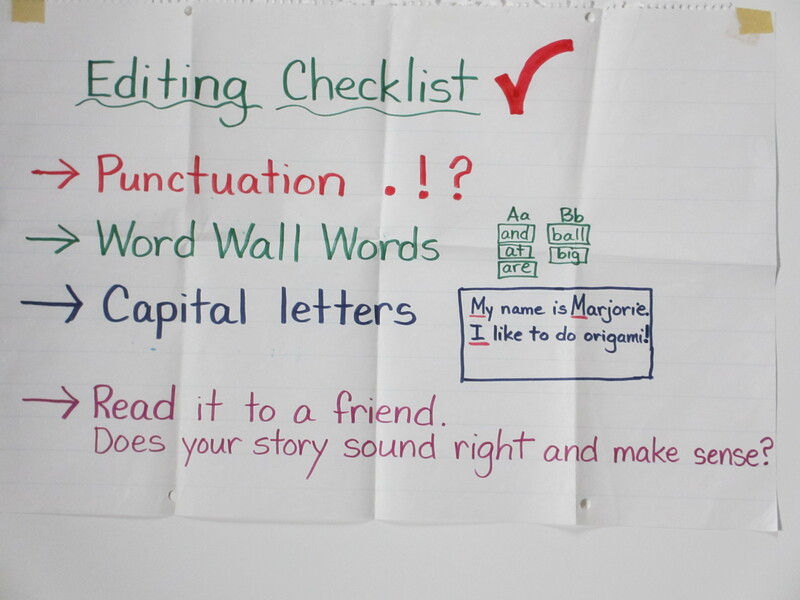 When it comes to editing, once we have taught a few specific strategies for checking one’s writing so it is easy to be read and added these strategies to a class chart, the time comes to make students take on more responsibility for checking themselves that they are using these skills without being told to by a teacher. One way to do this is to turn our editing charts into individual checklists, thereby handing over responsibility to the children. Editing checklists are probably the checklists most used and copied by teachers the world over. But they are often used by students as a one-shot deal. Check. Done. Check. Done. Instead, think about each category on a checklist as a reminder. 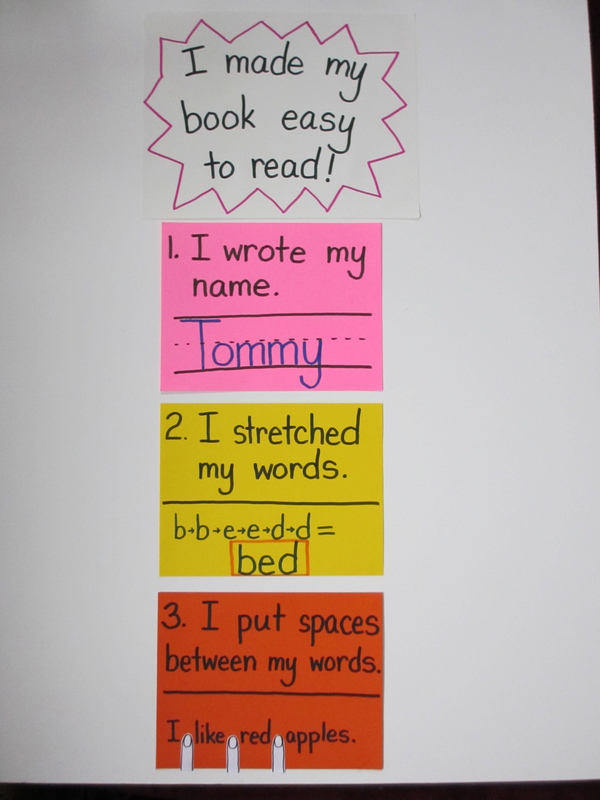 Then encourage students to tally each time they have used the strategy listed. Below are some sample “checklists” that can be turned into tally sheets that show how often a student has used a skill. This is a possible editing checklist for kindergarten that encourages an "I can" attitude. 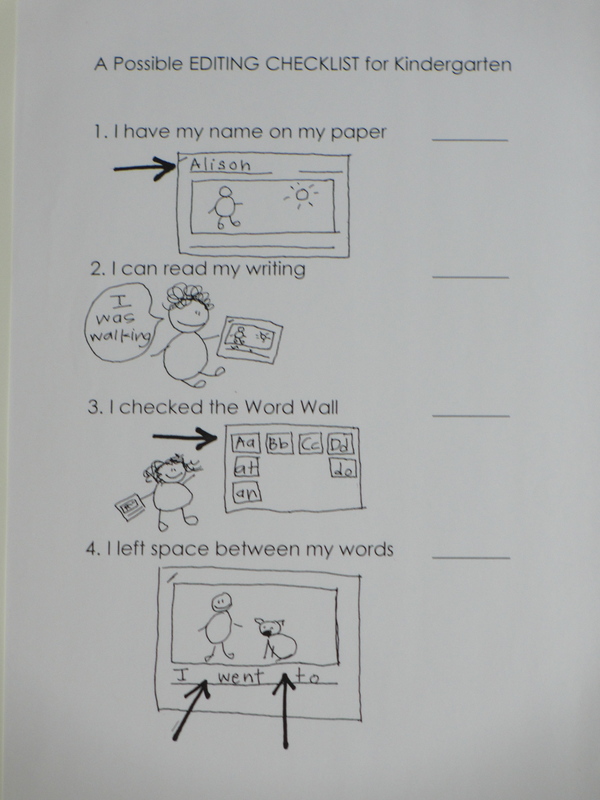 The key reminders on this checklist include, ‘I have my name on my paper.’ ‘I can read my own writing.’ ‘I checked the word wall.’ ‘I left space between my words.’ And, as always, pictures support the meaning of the words. 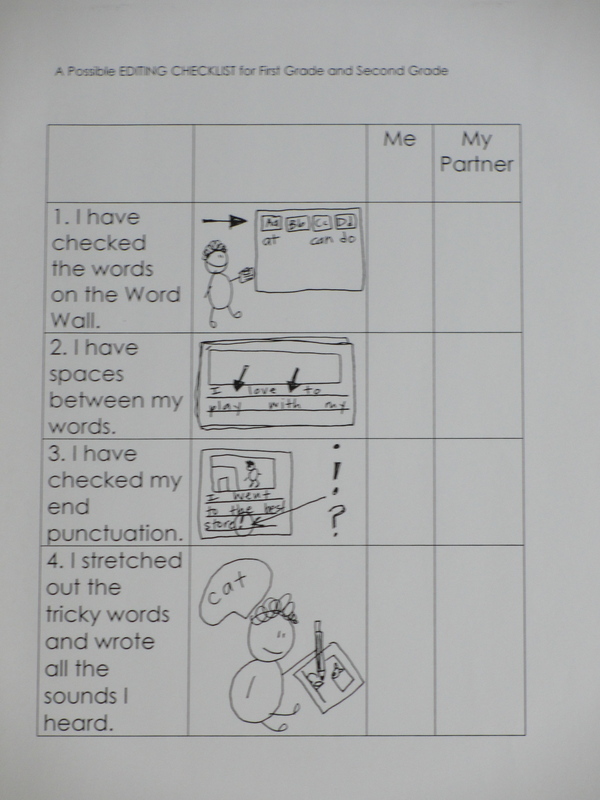 This is a possible checklist for first and second grade writers to use with partners. When it comes to editing, writers often turn to copy editors when they are getting ready to publish. With our young writers, this step is just as important. This checklist has a section for partners to participate in the editing process. Once again, you might encourage the participants to tally rather than just do a one time check mark. 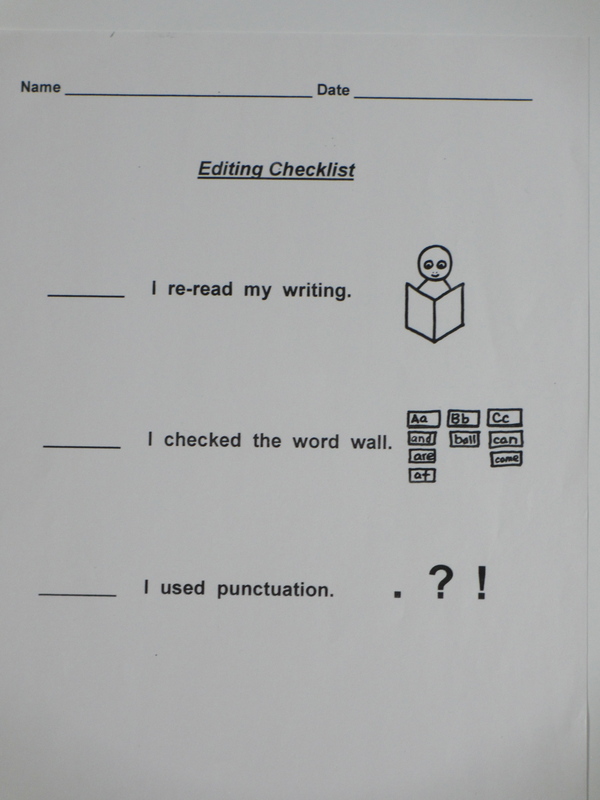 This editing checklist reminds children of the sequence writers follow when editing. All the charts we have illustrated above have been developed by trying to make our instruction as clear as possible for the children that gather before us. When something is important enough to put up on a chart, the next step is that everyone will start utilizing the strategy. To remind children to use initial capitals, a skill we hope most first grade children have been taught, you might interrupt the workshop to point out that now that everyone is using so many periods, it is a good time to check that after every period you are starting the next sentence with a capital letter. During the share that brings your workshop to a close you can add this important tip to your punctuation chart. Charts are meant to be planned, but also responsive to the needs we see as they come up. “Let’s do it!” might become a rallying cry. Final thoughts: slow down, clarify, reteach, and celebrate, every small moment. And make these moments public in the form of a chart. Charts help make the abstract clear and visual. 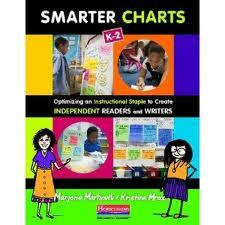 Most importantly, charts make our teaching stick. I already made the editing chart on “previous learning” for my Transitional Kinder kids and it turned out great!!! I’ve learned so much on your blog and can’t wait for more posts =) Thank you!!!!!!!!! Thanks for sharing such neat ideas! I can’t wait to use the checklist with my 1st grade kiddos! !